Greetings from The 88 Project! We are bringing you news, analysis, and actions regarding human rights and civil society in Vietnam during the week of July 2-8. Imprisoned blogger Nguyen Ngoc Nhu Quynh is on a hunger strike to protest authorities’ denial of her request to transfer cells; she fears remaining in a cell with a prisoner who continues to verbally attack her. A documentary screening centered on Quynh’s family was cancelled in Thailand this week after a request from the Vietnamese government. 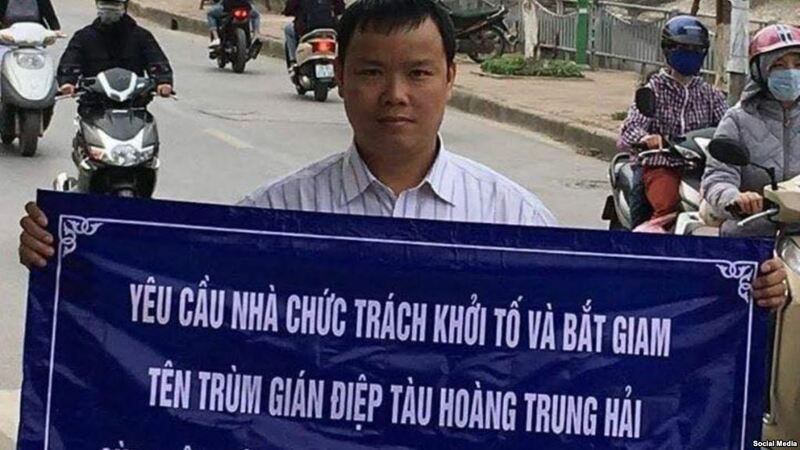 Journalist Le Anh Hung was arrested on July 5 in Hanoi for posting a letter critical of the government; he is charged with “abusing democratic freedoms.” Political prisoners Hoang Duc Binh and Truong Minh Duc have been transferred to remote prisons without notice. This week, we remember female political prisoner Ngo Thi Minh Uoc, a land rights activist from the Mekong Delta, who is currently serving four years and three months in prison. Attacks have continued against labor activist Do Thi Minh Hanh, and police have not investigated the incidents. In Hanoi, a former village chief self-immolated in protest of his three-year sentence for “abusing official position,” which he says was decided without evidence against him; he is in critical condition. In the news, read about Vietnamese Facebookers’ move to social media platform Minds, as well as an English version of an interview with Minds’s CEO. Coming up on July 10, National Movement to Revive Vietnam members Nguyen Van Dien, Vu Quang Thuan, and Tran Hoang Phuc face their appeal trial. Also, stay tuned for the launch of our new crowdfunding campaign that will raise money to produce video interviews with female activists at risk! Please take action for environmental activist Hoang Duc Binh after his recent prison transfer. As we announced last week, The 88 Project is hiring a Vietnam Human Rights Research Officer. This is an Asia-based/remote position. Read more, here, or in the Take Action section below. The application deadline is July 15. Imprisoned blogger Nguyen Ngoc Nhu Quynh (Mother Mushroom) is once again on a hunger strike, protesting prison conditions. June 29 marked one year since she was sentenced to ten years in prison under Article 88 of the 1999 Criminal Code. She is currently enduring extremely difficult conditions in prison, described as “mental torture,” enduring near-constant berating from a cellmate. She fears for her life, and prison authorities have denied her requests to meet with them. A screening of a documentary in Thailand about Quynh’s family was cancelled this week after local authorities received a request from the Vietnamese embassy to cancel the event. The film, titled “When Mother’s Away,” focuses in part on the struggles of Quynh’s family. Vietnamese blogger and journalist Le Anh Hung was arrested on July 5 in Hanoi and charged with “abusing democratic freedoms” under Article 331 of the 2015 Criminal Code for posting a letter critical of the government and its proposed law on special economic zones. Amnesty International condemned the arrest of the well-known blogger, stating: “Viet Nam’s government cannot keep using baseless charges and the threat of prison as a means of gagging its critics.” Hung has written for several international media outlets, including Voice of America, and is a member of the Independent Journalists’ Association. He faces up to seven years in prison. Authorities have transferred political prisoners Hoang Duc Binh (left) and Truong Minh Duc (right) to prisons far from home, and their families were not notified in advance of the move. This is an unjust but common tactic used to isolate prisoners from support networks. Binh is now in An Diem prison, Quang Nam province, in central Vietnam, over 500 km from his home province of Nghe An. He is serving a 14-year sentence for his environmental activism. And Duc was transferred from detention center B14 in Hanoi to prison No. 6 in Thanh Chuong, Nghe An province. He was sentenced to 12 years in prison on April 5, 2018, and his appeal was denied on June 4. This week, we remember female political prisoner Ngo Thi Minh Uoc, four years after her arrest. The land rights activist was arrested on July 8, 2014, charged under Article 88 of the 1999 Criminal Code, and sentenced to four years and three months in prison. She was tried alongside two others but is the only one still imprisoned today. Born in 1959, Uoc is from the Mekong Delta, and while she was officially arrested for waving flags outside the US Embassy, many believe she was actually jailed for her activism against land grabs. She is expected to be released from prison in October 2018. In the latest in a string of attacks against labor activist and former political prisoner Do Thi Minh Hanh, unknown attackers launched bricks and toxic gas into Hanh’s private family residence on July 3, where she is staying with her father. Police have been unresponsive, with some believing they are directly involved in the attacks against Hanh. She was released early from prison in 2014 after serving four out of seven years of her sentence for labor organizing. Amnesty International has called on local authorities to respond to the situation and work for Hanh and her father’s safety moving forward. A man set himself on fire this week in Hanoi after a court’s decision; witnesses say he suffered severe injuries, and he is now in critical condition. Bui Huu Tuan, a former village chief, was charged under Article 356 of the 2015 Criminal Code for “abusing official position, power in the performance of official duties.” He received a five-year sentence, reduce to three on appeal. The government accused him of accepting money from villagers to remedy a land dispute, and for illegally giving ancestral lands back to community members, though he maintains he operated in a legal way and says all of the money received was donated back to the village. Read one take on the case, from The Vietnamese, here. Unfortunately, self-immolation is not new to Vietnam, where activists and community members alike have sometimes taken drastic measures to protest governmental actions, including former political prisoner Ta Phong Tan’s mother, Dang Thi Kim Lieng. Three members of the National Movement to Revive Vietnam will face their appeal trial on July 10. Nguyen Van Dien, Vu Quang Thuan, and Tran Hoang Phuc were sentenced to six and a half, eight and a half, and six years in prison, respectively, in January 2018 under Article 88 of the 1999 Criminal Code. According to the indictment, Thuan and Dien were accused of posting 17 video clips on the Internet and possessing materials with anti-socialist state content; Phuc was accused of helping them in storing the materials and posting 3 of the 17 clips. Both Dien and Phuc are in poor health in prison, with Dien suffering from stomach issues and Phuc suffering from hepatitis C. Phuc’s mother has requested to attend the appeal trial, which is touted as being open to the public. Stay tuned this week for the official launch of our new crowdfunding campaign! The campaign aims to raise funds to produce video interviews with female activists at risk and former political prisoners. Follow us on Twitter @The88Project for the latest updates. Please take Amnesty International’s Urgent Action for Hoang Duc Binh, a labor and environmental activist who was sentenced to fourteen years in prison on February 6, 2018. His appeal of his sentence was denied on April 24, and he was recently transferred to a new prison, far away from his family, without notice. Please take the Urgent Action, calling for Binh’s release from prison and protection from mistreatment thereafter. Are you interested in human rights in Vietnam or Southeast Asia? Do you want to help encourage the right to freedom of expression? The 88 Project is hiring a Vietnam Human Rights Research Officer. This is an Asia-based/remote position. Please read the job description for more details and for information on how to apply. The deadline for applications is July 15.